Join the survivors of the February 14th school shooting at Marjory Stoneman Douglas High School on their nationwide #RoadToChange tour. 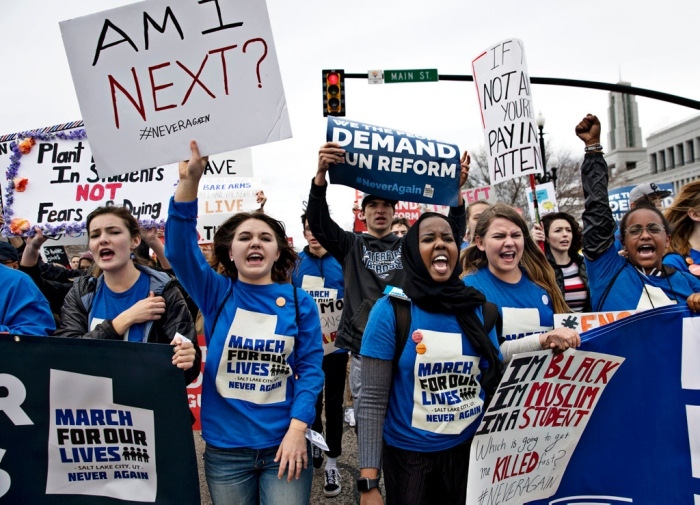 The leaders who have sparked a nationwide movement, including Emma Gonzales, David Hogg, Cameron Krasky, and Jaclyn Corin, will be stopping in Utah on July 14th to meet with local leaders, register voters, and energize the gun reform and school safety movement -- especially in areas represented by Rep. Mia Love, who is up for reelection this November and is one of the top 20 recipients of NRA money in Congress. Are you ready for the road to change? What will be happening, and where? We will be hosting a panel discussion with the students of Parkland, FL and the national March For Our Lives chapter, including Emma Gonzales, David Hogg, Cameron Krasky, Jaclyn Corin, and more youth leaders. This will take place at the event space within the Mountain America Expo Center, located at 9575 State St, Sandy UT 84070. Where do I park and how do I get in? You can park in the expo lot. Hall 1 is near the south end of the building. Please enter through the southern entrance that faces west for easiest access. We've had a couple of changes, but tickets are NOT required. If you do have a ticket, you will receive priority access at 5:30PM and first choice of seats. You can still attend without a ticket! If you're interested in priority access check here. I’m a member of the press, how can I get in touch? Email info@marchforourlivesslc.com to get in touch with the students anytime before 7/14. Please be aware that we will not be able to connect you to the Parkland students. You can text our Advisor at 571-289-6060 for specific media requests. I want to help promote the event, how can I do that? What about t-shirts? Where can I buy them? You can visit the March For Our Lives SLC store at this link: https://represent.com/store/march-for-our-lives-slc. We cannot guarantee that merchandise will arrive in time for the event. There will be merch for sale at the event as well. Will you have ASL interpreters? Yes! We will have an excellent interpreter team. Anyone needing ASL services is welcome to come to the front of the room to be seated with the accessibility section. Will there be any kind of marching component to this event? No, there will not be a march for either events. Will the locations be wheelchair accessible? The space will be ADA compliant, and folks with disabilities will have access to the front of the room, where we will have reserved seating for students and disabled participants. What will the ADA setup be like? We will have ADA sections in the front of the crowd area. These will be clearly labeled, and we will have an accessibility team to ensure that the spaces are easily available to all who need them. We will also have ASL interpreters on site for our deaf/hard-of-hearing guests. There will be ample parking in the area around the expo center. I am a student who wants to attend, but I paying for public transportation would be difficult for me. What should I do? What are you doing to ensure that participants are safe? We will be working closely with the local PD as well as the security team of national March For Our Lives to make sure that this event remains safe and peaceful. That said, we understand that many participants will not necessarily feel safe around law enforcement, so please be aware that law enforcement will be present and monitoring the event. There will be ACLU legal observers present to observe and report any incidents as needed. Firearms will not be allowed into the event, and bag checks will take place for admission. Will there be counter protestors? We cannot predict the activities of any counter protesters who choose to come to the event. Please be respectful of all participants and ensure that you are following the laws and policies of the area. We are asking students to wear either March For Our Lives gear, school colors/clothing, or orange, the official color for gun violence prevention. Educators are asked to wear red. Everyone else is asked to wear either March For Our Lives gear, black/blue (MFOL colors), or orange if possible. What about signs? Are there messages I should stick to? We will have signs to hand out that you can take with you. Please do not bring large homemade signs. If you do bring signs, please ensure that you only use them sparingly and do not impede the view of other guests. Yes! Children are welcome and encouraged to attend. We are taking every possible measure to make sure children (and all attendees) are safe. The majority of our organizing team is 18 and under and this movement is very much student-led. Yes, there are facilities available at the expo center. Will there be voter registration? Yes, it will be managed by the nonpartisan, nonprofit organization Voterise. Email justin@voterise.org for more information.